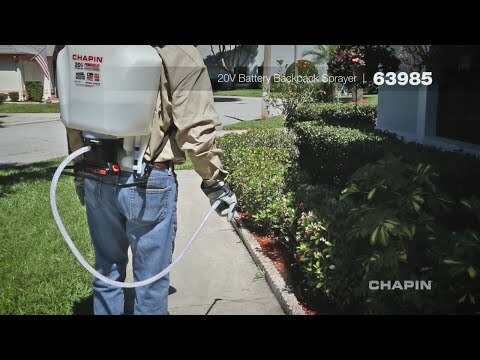 The Chapin 63985 is an affordable backpack sprayer equipped with a battery powered pump. It’s easy and effortless to use but there are also some disadvantages reported by the users. The Chapin 63985 offers a large, 4-gallon tank – translucent and with markings to see the amount of liquid inside. The opening is really wide (6 inches in diameter) so it’s very easy to add chemicals without spilling, fill it using a hose or take out the filter for cleaning. On the other hand, many users complained that the threads on the lid do not align precisely and you can cross thread them easily. Also, the cap can leak when you tilt a full tank to the side (when putting on for example) and the liquid ends up on your back – not good. Like similar sprayers it is a bit cumbersome to put on your back, a table definitely helps (versus putting it on directly from ground). The harness (shoulder, waist and chest straps) is adequate and won’t hurt your back. However, we can find much better straps on other Chapin models, here they are quite thin and poorly padded. Without a doubt, the main advantage of this sprayer is the battery powered pump. Spraying is so much easier when compared to manual (or even handheld) units – you don’t have to worry about the pressure at all, the pump maintains a nice constant flow without any drops or spikes. It’s also very quiet, you can feel a little vibration but nothing that would bother you. The pump itself is capable of delivering 35-40 PSI and users report a vertical reach of about 15 feet if you use a narrow stream. The Black&Decker battery offers a fairly long working time (1.5-1.75 hours of continuous spraying) and can be used in other B&D 20-volt tools as well (charger is included). Unfortunately, while the electric pump makes using the unit a real joy, it is also another component that can malfunction, making the entire sprayer useless. And some customers experienced problems of this sort – that it didn’t work right out of the box or stopped working after some time. The 63985 comes with 3 different nozzles (one adjustable) to give you all types of spray patterns for various jobs – a fan, cone, straight stream or fine mist. A small disadvantage is a missing lock-on feature (to save battery probably) so you have to hold the trigger all the time. However, one customer wrote that he contacted the support and got a new shot-off with the lock. Conclusion: If you’d like to enjoy spraying without pumping a handle, the Chapin 63985 might be a great option and we can recommend it to you. 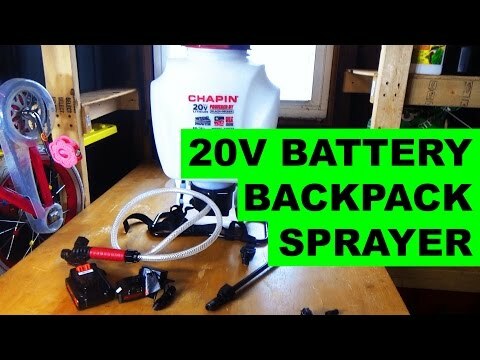 However, if you don’t plan to use it only a few times per year, a cheaper manual backpack sprayer can be a better option. Does it mix the liquid in the tank? No – if you need a model equipped with an agitator, we would recommend you the Field King Professional. How should I treat the battery to ensure maximum lifetime? Always store the batteries inside your house in reasonable temperatures – never leave them on direct sun or outdoors during winter! Black and Decker also advises to recharge the battery as soon as it is out of power.